During Christmas 1914, British and German soldiers on the Western Front temporarily stopped fighting to sing carols and exchange gifts. Although the truce was a one-off event, soldiers throughout the First World War (1914-18) found ways to maintain morale and mark the festive season while separated from their loved ones. 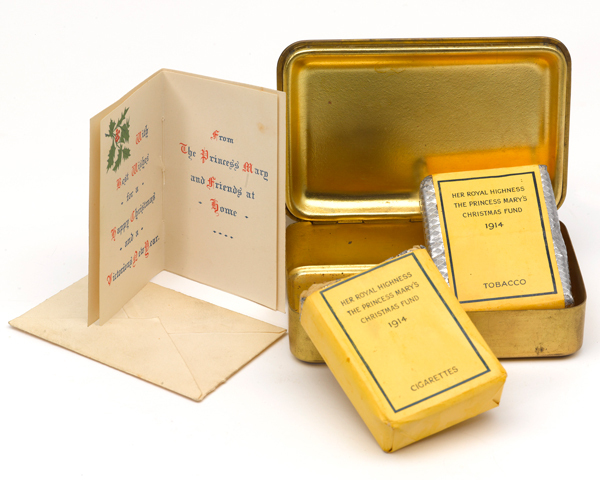 As well as exchanging cards at Christmas, soldiers received gifts from their loved ones or from charities. 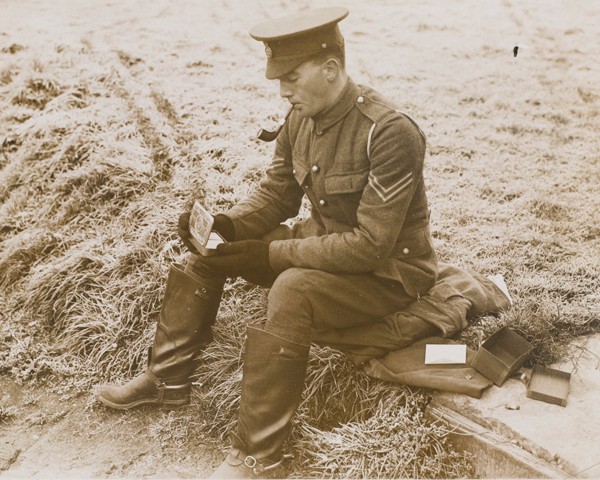 Parcels packed with goods from home improved the morale of those faced with cold and wet weather in the trenches. Tobacco, clothing, sweets and chocolate, plum puddings, reading material and games were all sent to the front. The great and the good called on people to send gifts. In December 1914 the wife of Field Marshal Sir John French, British commander-in-chief, asked the nation’s women to knit and post 250,000 mufflers to keep soldiers warm. Great efforts were made to distribute these gifts. Despite huge demands on an already stretched postal service, more than 355,000 boxes were successfully delivered in time for Christmas Day. 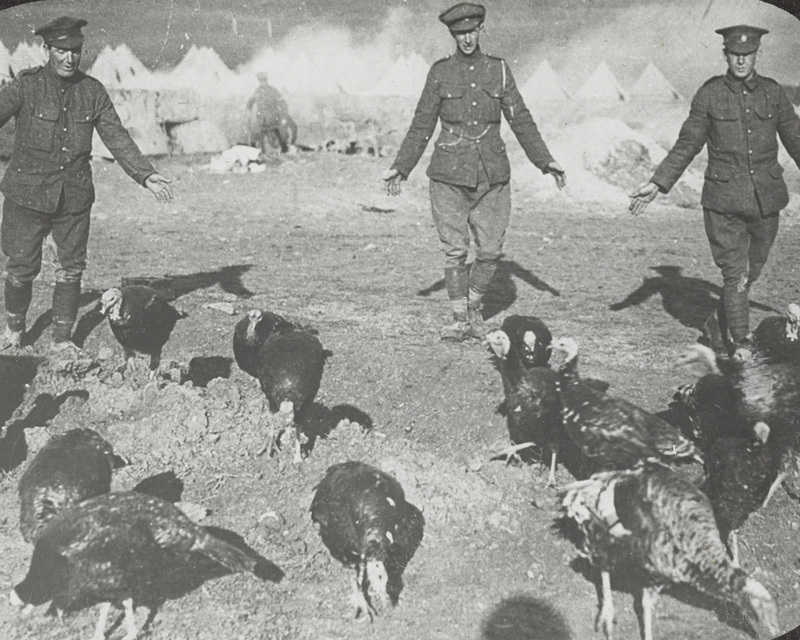 Those soldiers lucky enough to be away from the front line at Christmas usually had at least a basic Christmas dinner in their billets and dugouts in the reserve areas. But for the troops manning the trenches it was the usual rations, possibly supplemented with gifts from home if they were lucky. Often soldiers would share these among their comrades. 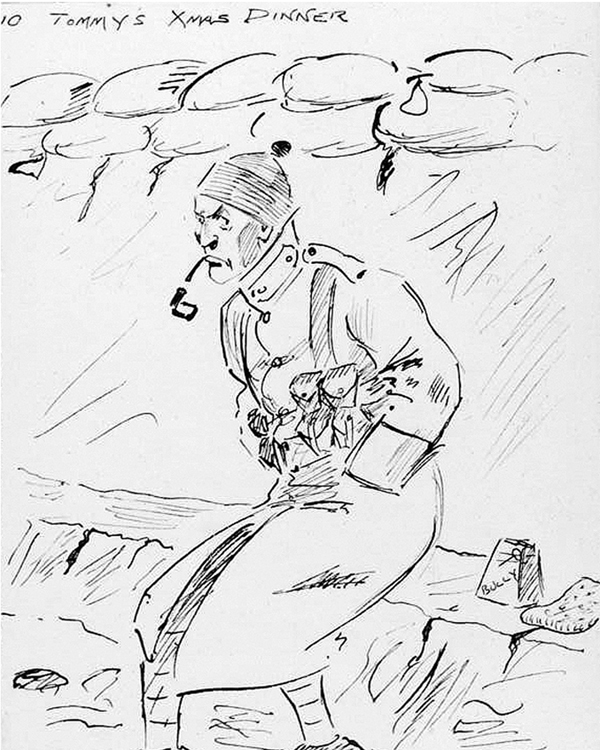 This sketch, entitled ‘Tommy’s Christmas dinner’, depicts a disgruntled soldier stuck in a trench with only bully (corned) beef and army biscuit for his Christmas meal. Other tinned goods consumed on Christmas Day included ‘Maconochie's beef and vegetable stew', a concoction that had more fat and gristle than meat. The notoriously hard biscuits could crack teeth if not first soaked in tea or water! 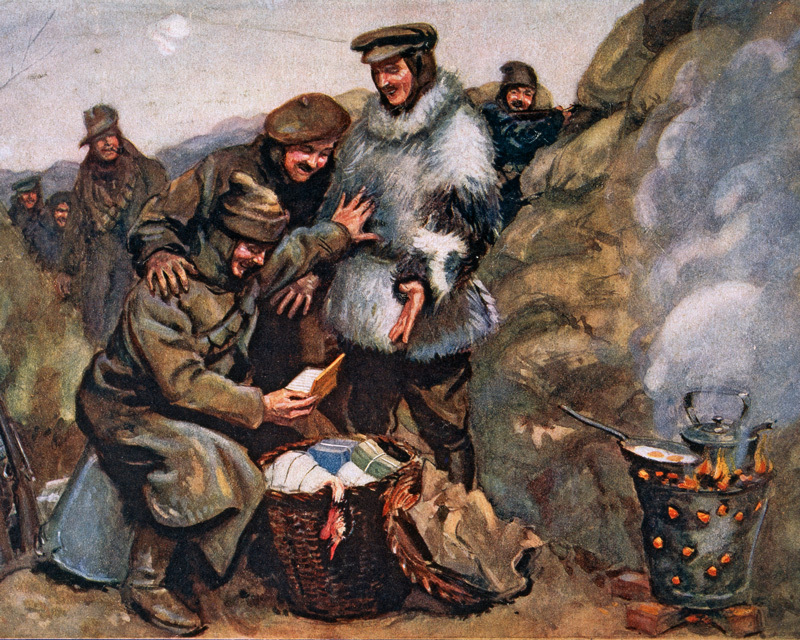 The most famous Christmas act of the war was the truce of 1914. Unofficial ceasefires between British and German soldiers took place along parts of the front. In the trenches on Christmas morning carols were sung and rations thrown across the opposing lines. It was not long before the more adventurous soldiers started to venture into no-man’s land. Here they exchanged food, tobacco, cigarettes, drink, badges, buttons and caps. Games of football even broke out. The only result recorded was a 3-2 victory by the Germans, quoted in several soldiers’ letters. 'As darkness came on lights were seen in the German lines in the Rue du Bois, at first our fellows fired at them and the Germans put them out - gradually the firing died down, and all the enemy sniping ceased. The silence was almost uncanny and we were all very suspicious and extra vigilant, expecting some trick. Later on... their whole line was illuminated. I think they had hoisted lanterns on tall poles on their parapet and in their trenches. After they began to sing... They sang beautifully the whole effect was weird in the extreme. They then started shouting across to us, which we replied. As well as exchanging gifts, both sides saw the lull in fighting as a chance to find the bodies of their comrades and give them a decent burial. On some parts of the front hostilities were officially resumed early on Boxing Day. In other areas the ceasefire lasted for several days. Although strict orders were issued against fraternisation by the high command of both sides, many junior officers tolerated the truce and allowed events to take their own course. They never doubted that eventually the fighting would resume in all its fury. Indeed, for the rest of the war there was to be no major repeat of the 1914 truce. The event therefore acquired semi-mythical status and has since been celebrated as a rare glimmer of humanity in a brutal conflict.